Due to the loss of early police records, it is not absolutely clear when the first police officer was stationed in the Pine Rivers area, but circumstantial evidence indicates that Senior Constable John Farquharson was active in the district from December 1875. There are regular newspaper reports from 1876 which confirm Farquharson’s continued presence on the Pine until his transfer and replacement by Hugh O’Loan in 1879. An 1877 account mentions that a “lockup at the police station, near Sir Arthur’s Bridge, has already accommodated seventeen various offenders”. In all probability, this is the lockup now located at Old Petrie Town. The first police buildings were erected south of the existing buildings and it was not until 1883 that sections of the original North Pine River Reserve were excised and gazetted for police purposes and to provide for the new courthouse which had been constructed during late 1882. One event which precipitated the previously overlooked gazettal of this land was a court case in November 1882. William Leis (aged 16) and Louis Leis (15) were charged with maliciously damaging the fence surrounding the police station. Although the evidence clearly showed that the Leis brothers, assisted by Carl Ebert (16) and Archibald Hamilton (15), had torn down the rails from the fence and soaked them with kerosene in their attempt to set them alight, it appears likely that the boys were reflecting community concern that the police buildings were improperly sited on public land. The case was dismissed when it was discovered that “the Gazette notice proclaiming the land a reserve could not conveniently be produced”. The original road reserve had, in fact, never been gazetted as such. Petrie Police Station, late 1930s. The names of both the Police Station and the Court of Petty Sessions were changed to Petrie on 29 May 1954 to bring them into line with the Post Office and the Railway Station (which had changed their names many years before in 1911). 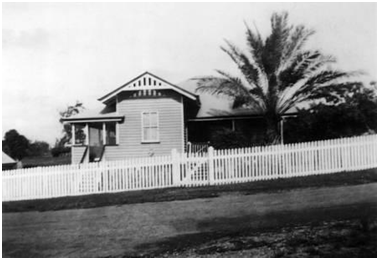 During 1915 tenders were called for the erection of a new Police Station at Petrie and the premises were occupied in December of that year. After 75 years of service, the 1915 building was acquired by the Samford and District Show Society in July 1990 and was relocated and renovated at the Samford Showgrounds, Highvale. Brisbane Courier, Saturday 27 October 1877. The Week, Saturday 11 November 1882.